Our shop is located in Adinkerke, Belgium, which is just over the French/Belgium border, about 40 minutes north of Calais. We have a great number of English customers, many of which come back to us repeatedly. 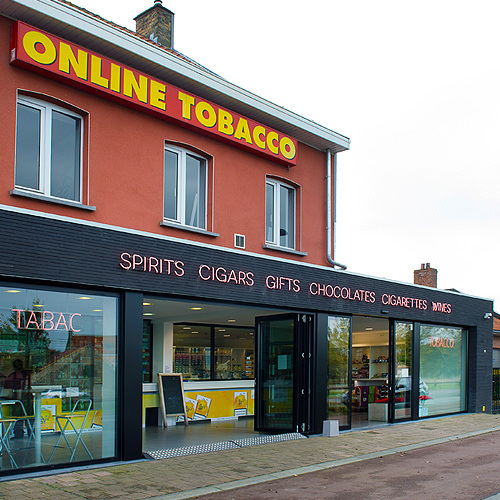 As one of the busiest and biggest tobacco shops in Adinkerke, we keep a larger stock than most and are a very popular destination for those returning to the UK! We are specialized in smoking and smoking related products, such as, Golden Virginia, Drum, Old Holborn, Superkings, B&H and many other quality brands. We also provide other products, like cigarette papers, tubes and cigarette making machines, quality Belgian chocolates and carry a range of wines, beers and gifts for your convenience. Tobacco in France is about half that of England, but, in Belgium, it is far cheaper still at about half the French price or, to put it another way about 70% off the English price, for the same product! We accept all major credit cards and cash, in Sterling (£) or Euro (€). We only sell via our physical store, no online shopping. Please note that due to current Belgian legislation we are not permitted to send goods by post or ship.